Combine buttermilk, honey, 1 tablespoon ginger and 1 teaspoon garlic powder in a baking dish. Cup chicken tenders in half or thirds and add to buttermilk. Marinate for 2 hours or overnight. Preheat oven to 450º F.
Combine panko, ginger, garlic, seasoned salt, and flour in a large bowl. Coat chicken pieces in panko mix, then lay on a wire rack sitting on a baking sheet. Continue with remaining chicken pieces. Spray each pieces with cooking spray or olive oil. Bake for 10 minutes, flip, coat with cooking spray, and bake for another 10-15 minutes. Result: Yummmm! The honey drizzle brings out the ginger flavor so well! A++!! I also whipped up some muffins Jessica posted a recipe for earlier this week. They looked and sounded so amazing, I was sure to save the recipe. I hadn’t made it through the list of ingredients until yesterday and I realized I had everything on hand. Including coconut oil. Not gunna lie, I chuckled a bit. Oh, the irony! But man, these guys are good! Mix flour, sugar, and baking powder in a large bowl. Add coconut oil, coconut milk, bananas, vanilla, and eggs, and mix until combined. Fold in shredded coconut. Top with a sprinkling of raw turbinado sugar. Bake for 15-20 minutes or until golden brown. Yields 12 muffins. *I swear by the Let’s Do Organic reduced-fat coconut. 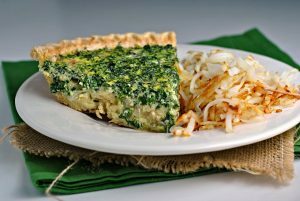 The flavor is wonderful and it is much lower in calories and saturated fat. Result: Delicious! I haven’t made muffins in AT LEAST 3 weeks. Entirely too long! I love that these muffins contain plenty of fat (albeit saturated). I think next time I’ll add some pecans or walnuts for some more protein and healthy fat. But they were VERY good…and easy! Question: Do you prefer dates in the home, or outside of the home? If you stay in, do you prefer to cook or order in? Bake for 15-20 minutes or until golden brown. Muffins look awesome, im going to definitely try those sometime soon. 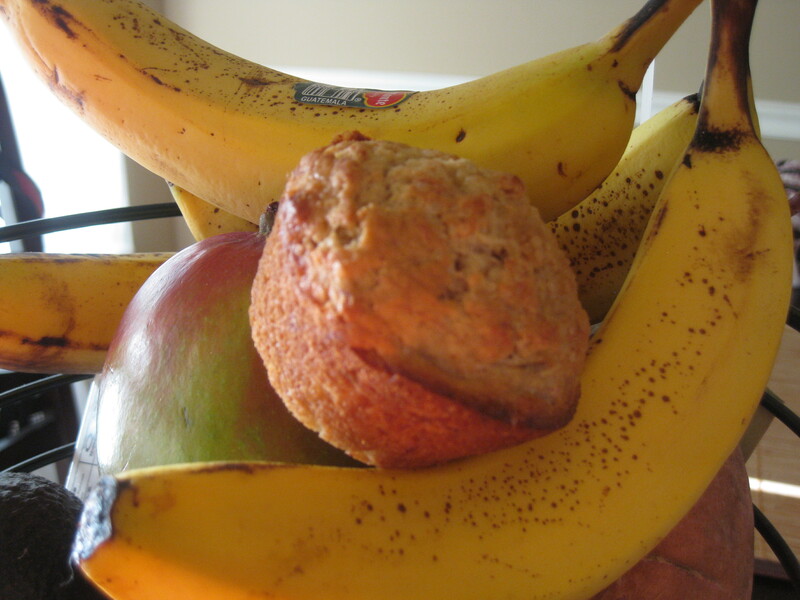 I cant remember the last time I had a muffin so I must be over do! Those muffins look so good!! Your post shocked me – today’s date – I can’t believe it is May already! And, totally agree- I love date nights in!! Have a great weekend! That muffin recipe sounds delish. I love all staying in and going out, and cooking together and take-out! It’s all about mixing it up. Have fun at the farmer’s market! You are too cute Nicole, Mr. Prevention is a lucky guy to have such an amazing wifey and a good cook! I love dates in and dates out. I usually like to cook if we stay in because it makes it more romantic, but nothing beats a good dinner out either. Both those recipes look super yummy. I prefer date nights out, it is my one night off from cooking and dishes and dogs 😛 I love my dogs but a break is nice and a break from the dishes even more so! 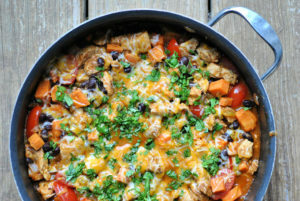 I love all the recipes you post…even if they are from other bloggers. I know you will give honest reviews and only blog about the good stuff! I’m going to try out the chicken soon! Date nights. We go out if its a special occasion or if we’re doing things with friends but usually we stay in. It’s cheaper and nice to kick back instead of always being go go go. Yum! Mr. Prevention is a lucky guy! Have a great weekend. I’d just prefer….a date! LOL. Usually I am a homebody (read: cheap). It is fun to go out sometimes, though – and especially wonderful to not have to cook/clean up afterwards! I didn’t do as good as I would have liked to have done, but I think my excuse is somewhat legit. I got braces 2 weeks ago and even after the pain went away I still can eat hardly anything crunchy or that requires a lot of chewing. So..most of my food as of late has been soup, oatmeal, yogurt. My goal was to eat more veggies. So when I did try to eat them, they were always steamed so I didn’t have to chew on them. But I plan to keep working on it! I saw those chicken nuggets on Jessica’s blog and drooled too! Lucky duck that you are going to the farmers market! The Crisp Honey Ginger Chicken looks very good. And those bananas? I love bananas when they get to that stage. Hope you’re enjoying your weekend. I love date nights in because Matt and I like to cook together. Although it is nice to go out once in a while – someone else has to do the dishes! I love staying in. Partly because it means I dont have to get dressed (or shower) if I dont want to. Your chicken dish looks great. Thank you for sharing! Cheers! Peter would be drooling if I made him crispy honey chicken and banana muffins for a date-in. You’re such a good cook, Nicole! We definitely prefer staying in for a date night, and cooking our own food. Mostly so we can sit around in pajamas and cook and bake and try out fancy new recipes (well, Peter makes the fancy recipes, and I eat them 🙂 ). Have a great time at the Farmer’s Market! Sounds like a fun Friday night! If I were dating (ha) I think I would like a good mix of date-ins and date-outs. Since I feel like I can cook most things, it seems silly to go out…unless of course it’s for SUPER good food. Otherwise, I’d rather just cook. Ice cream out though. For sure. Or pinkberry. A pinkberry date would be excellent. That chicken looks fabulous and so do those muffins! Yum! Have fun at the Farmer’s Market…let us know what you get! My do what you don’t didn’t end as strong as I’d have hoped. Busy weekends took over my meal prepping time but eventhough April is over I plan to prep whenever I get a chance. Thanks for the inspiration. I’m not gonna lie, I actually like going out. Simply b/c we don’t do it often. But sometimes, date nights in are the best thing you could ask for if its been a stressful week! 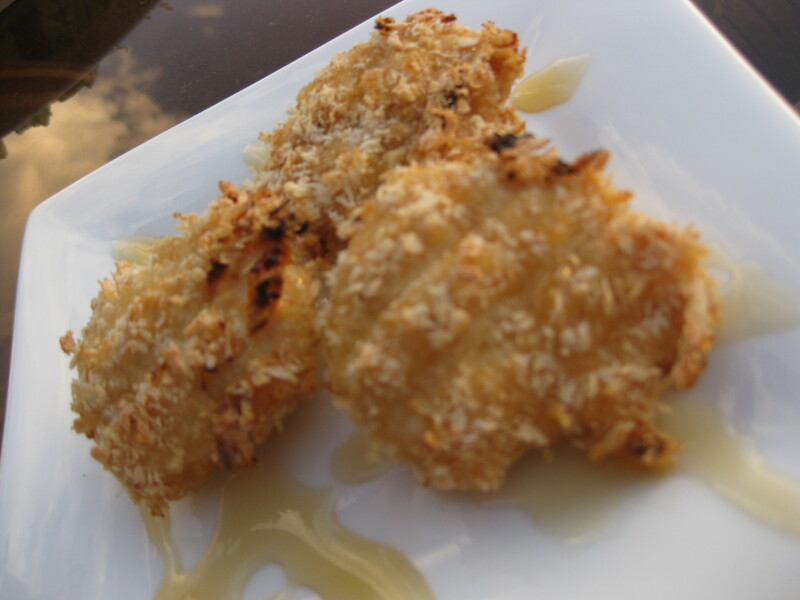 Funny, I was testing a coconut crusted chicken nugget recipe on Friday for my next book! Love the coconut flavor and I agree with you on the supposed ‘health benefits’. Coconut is fine, but not some new miraculous health food. It’s the whole moderation thing… As far as date night, since I have kids, I opt for dinner out!